The Mountain Machu Picchu is the most spectacular alternative to Huayna Picchu, available at the Sanctuary of Machu Picchu. Located south-west of Machu Picchu, rises 3,082 meters (10,112 feet) above sea level; this mountain hike, offers unrivaled views of the Inca City of Machu Picchu and the surrounding mountainous landscape. At their summit Inca priests performed rituals on special dates, also performed liturgical greetings to Apu Salkantay. How to find the point of entry? The control booth of the Machu Picchu Mountain is located within the same Inca City of Machu Picchu; to reach it you must follow the trail "Guard House", from the main entrance of Machu Picchu, small wooden signs point to the start point of the walk; it takes the same path leading to the Puerta del Sol (Intipunku), a couple of minutes from Lookout or House of Guardian; follow the the right direction, down a road that climbs through agricultural terraces. Following the trail of the road for about 15 minutes, reaches the control cabin of the mountain; in this place, you must show your passport or identity document and the admission ticket, so too, you must sign the guestbook. The journey from the entrance Machu Picchu to the cabin of the guardians, will take about 30 minutes. Unlike the Huayna Picchu or Putucusi Mountain, the trail to Mountain Machu Picchu is wide and well-marked. Having reached the cabin of the guards, the route follows a relatively uniform ascent, by a slope at an angle of 30 or 35 degrees, for about 1 hour; gaining altitude slowly and steadily. 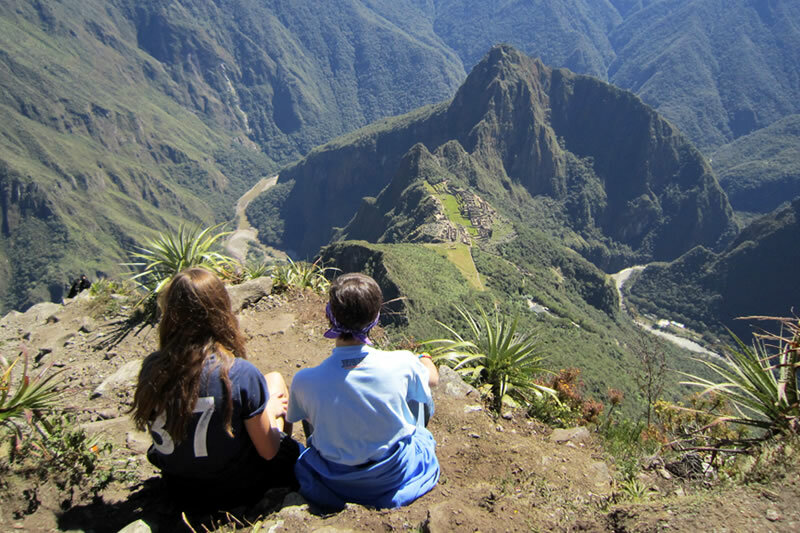 Little by little they will reveal, beautiful views of Machu Picchu and the surrounding mountains. And as it rises, these will become more impressive each time. There are several points where you can rest during the tour. As you progress down the path, the path becomes narrower and difficult. After another 30-minute walk, you’ll pass through a stone door before following a narrow path to the summit. A small round hut provides shelter and seating area. The descent follows the same route, and takes 20 to 30 minutes less. Moderate to Defiant. The hike Machu Picchu Mountain wing is considered moderately difficult hike to challenging, and although not required exceptional physical, you will need to be in good shape. During the rainy season, the road may be more slippery so increases the difficulty of the climb. Time required: Climb between 1h 30m and 2h. Altitude of the top: 3,082 m.a.s.l. Height in relation to Machu Picchu: 652 meters. Terrain: Stone Inca path with grass and land places. First Entry: 07:00 hrs. – 08:00 hrs. Second Entry: 09:00 hrs. – 10:00 hrs. Tickets: Limited to 800 entries per day, with 400 income in each group. Ticket Type: The ticket to the mountain Machu Picchu must be purchased as a combined entrance ticket (Machu Picchu + Mountain), there is no way to buy it separately. The Machu Picchu Mountain is accessible throughout the year, but like the Huayna Picchu Mountain, during the rainy season (November to April), there is greater chance of strong rain, making the trail becomes slippery and more difficult to traverse. The region has a subtropical climate throughout the year, with daily temperatures averaging 18° C (64° F). During the dry season, the moisture skirts 40 % or 45 %, reaching 60 or 65% during the rainy season. Make early hiking, offers you cooler temperatures and more shade. The dry season is definitely the best time for hiking Mountain Machu Picchu. The entrance to the Machu Picchu Mountain is suspended from 16 to 30 April, for conservation and restoration work. The climate throughout the southern region of Peru, usually is unpredictable, the rains can occur at any time of the year, so you should be prepared for rain or sun. The trail is mostly stone steps, so it is better to use comfortable and lightweight shoes. It is advisable to carry a light rain poncho, and sunscreen. Identity card / Passport / Student ID Card. Electronic ticket Machu Picchu printed (without this you can not enter Machu Picchu).